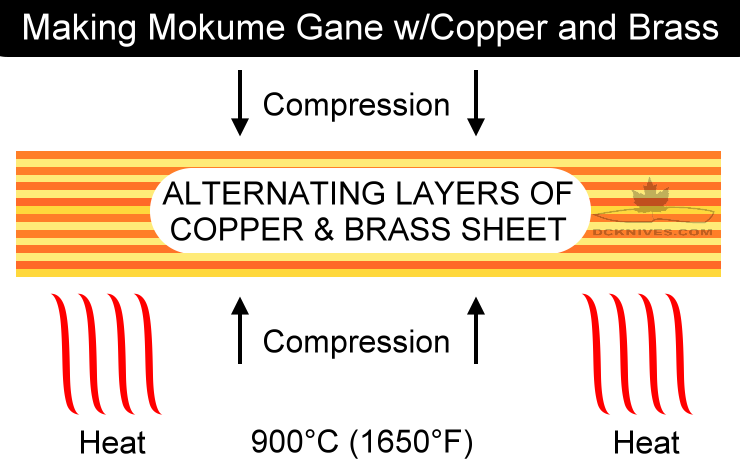 I've been wanting to make some bolster material from a blend of copper and brass for some time. Studying a few web sites and watching some YouTube videos has prepared me for my experiment. But first a little background. 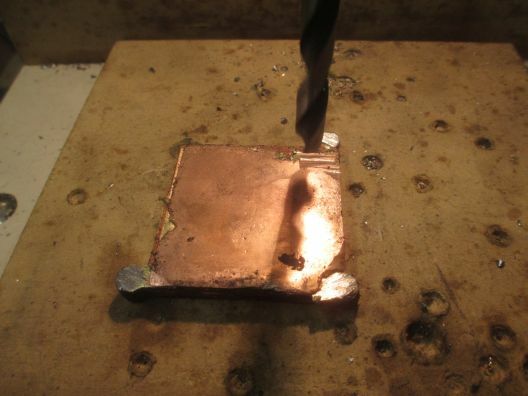 Metals can weld together with appropriate pressure, heat and time. Imagine two plates under extremely high pressure, say in a hydraulic press. Even at low temperatures, over time these surfaces can fuse together. Increasing temperature reduces the pressure and time requirements. 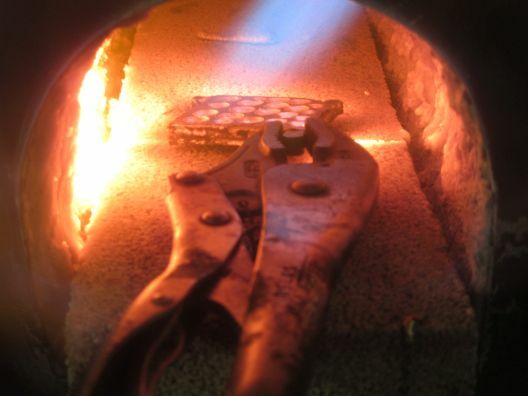 Raising the temperature to near melting points of the metals and applying moderate pressure (a hammer or press), will cause the metals to weld together. So we're going to squeeze some metals, heat them to near melting point and see how they stick together. 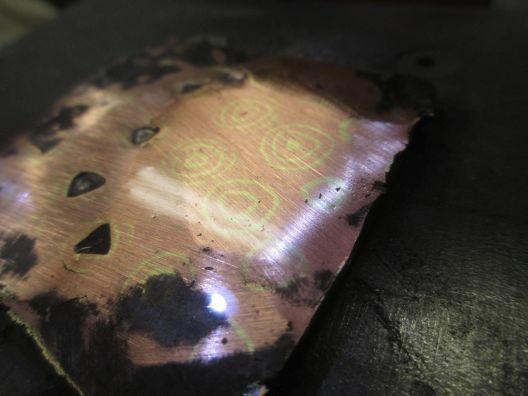 Apart from the heat, pressure and time factors, the surfaces of the metals need to be prepared for the fusing. This means cleaning them with sandpaper and removing any oil, dirt or grease and preferably not having any oxidization on the surfaces prior to clamping. The edges of the stack will be brushed with a flux made from Borax and distilled water to reduce oxygen from reaching the surfaces and cause the laminations to fuse improperly. This is my first of two experiments I want to try. 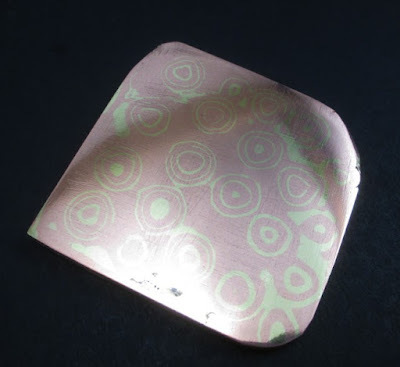 Copper and brass raindrop pattern mokume-gane. 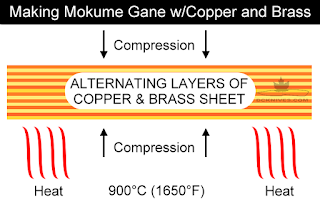 Pure copper melts at 1080°C (1976°F) and brass (which is copper and zinc) has a melting point around 930°C (1710°F). The brass sheet I have is 0.015" K&S #252 and the copper is 0.025" K&S #259. 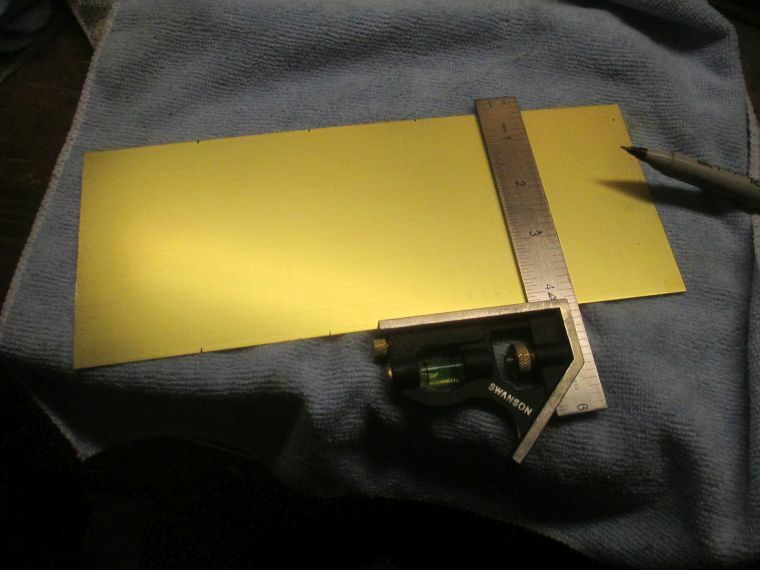 I cut the sheets into 10 pieces of roughly 2" square. 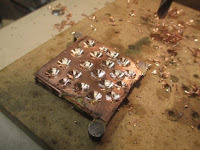 First, I will prepare the materials by cutting them into the sizes that I want. 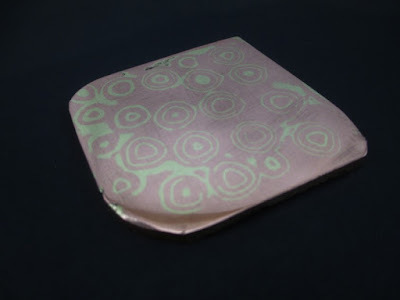 I am looking to make a finished piece of raindrop pattern approximately 2" x 2" x 3/16"" thick. 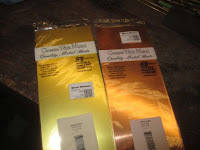 These are brass and copper sheet from the hobby store. I will be using one of each sheet. 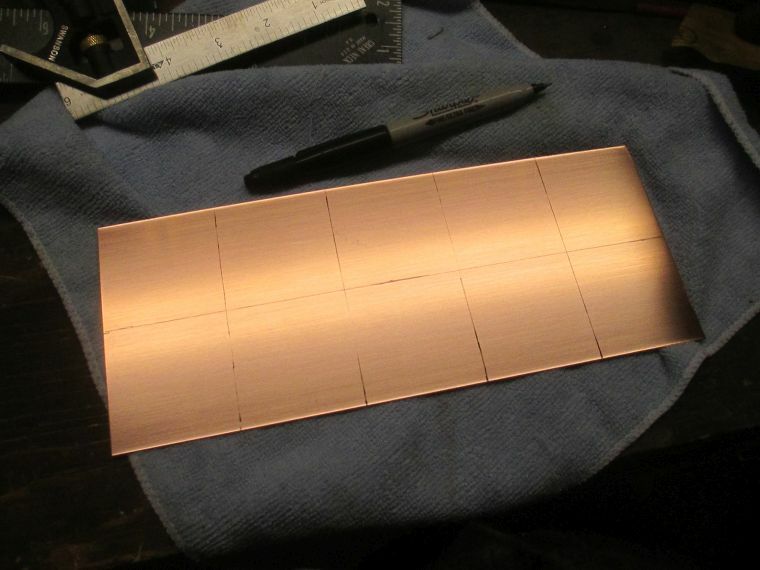 Mark out the brass sheet into ten 2" x 2" squares. 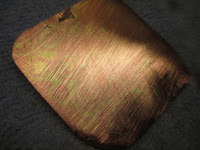 Same for the copper sheet. 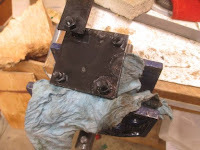 Cut the squares on the band saw, or if you have good aviation snips those should work too. 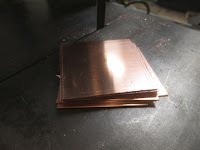 This is the 10 pieces of copper. 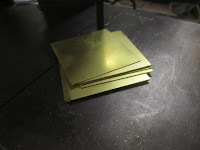 Here's the brass pile of 10 pieces. 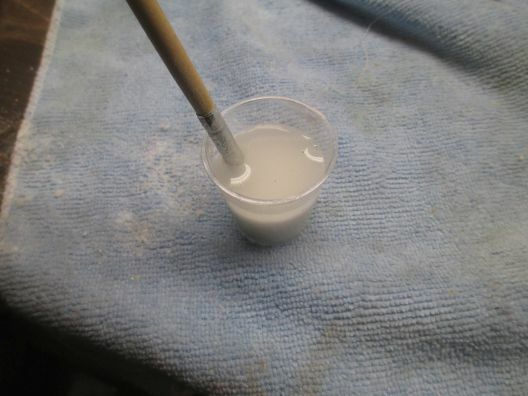 Clean the pieces with acetone and a clean shop towel. 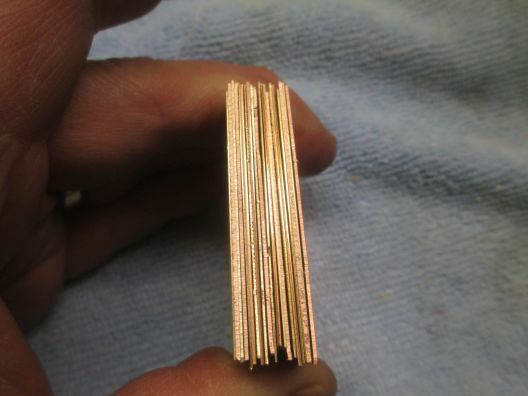 Stack alternately, one copper, one brass, one copper, one brass and so on. If the metals you are using are oxidized/tarnished. Clean them bright with a Scotch-brite pad before cutting the squares. Once cut, de-burr and wipe with acetone. 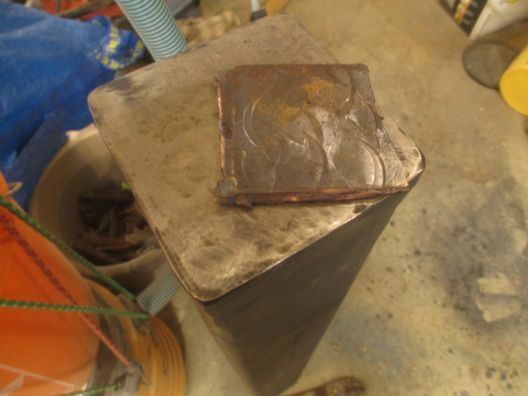 Put the stack into a press and clamp it down. I used two pieces of 1/4" steel with four holes. The bolts are 5/16". Use whatever you have. Don't count on keeping the bolts. Borax is used as a flux to keep oxygen away from the surfaces while heating. Make a paste of 2 teaspoons borax and 2 teaspoons distilled water. Brush the borax paste on the outside of the stack. 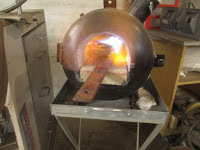 Attach a bar or something for a handle and place the stack into the forge. 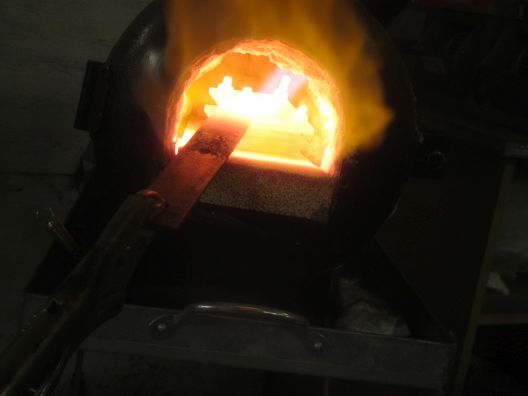 Turn the piece a few times while in the forge. You want the heat uniform and all way through. As it approaches orange-yellow. Remove from the forge. DO NOT OVERHEAT. Brass melts before copper. You will see the brass starting to liquify a tiny bit. Once out of the forge let it cool down slowly. This takes a while, so be patient. Here I have it cooled. I had to cut the bolts off, but I was successful in getting a good press on the metals. Now to the drill press. 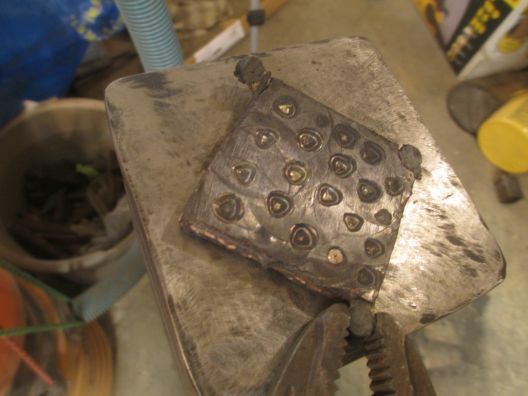 Drill a series of random partial holes, varying depth. These variations make more random raindrop patterns. Hammering on the anvil. This pushes the material up into the holes. I used a 3 lb. hammer and my post anvil. Another heating and back to the anvil. 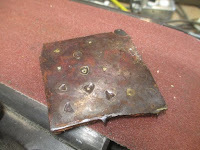 The goal here is to move as much material into the holes before the billet cools. This is where I got to before grinding. As I am grinding I can see the raindrop pattern appear. You are going to lose material here. There is not a whole lot you can do about it. 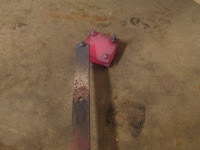 The better the flattening job on the anvil the less grinding you'll need to do. 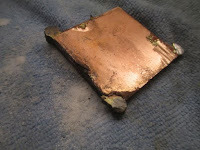 Coarse grinding with 60 grit will remove the metal fairly quickly. 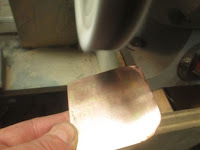 Once there are no more inclusions (visible dents), try some sandpaper in the finer grits. I am using some wet/dry 120 grit automotive sandpaper here. 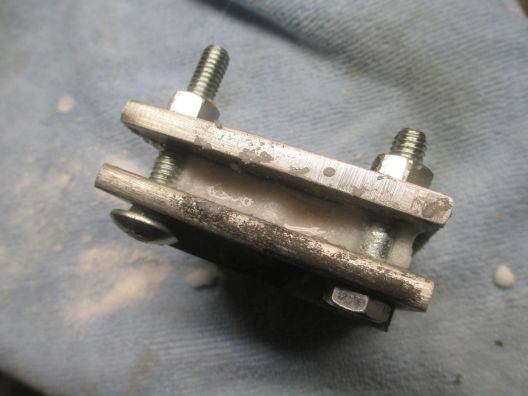 Water keeps the dust down and lubricates the surface washing any larger grit away. A squirt bottle works well for this. After you get sanding to 400 grit, a quick shot on the buffer with some black compound should reveal an sweet shine. I don't need to perfect this finish as I will be purposing it at a later date. The end result is 2-3/8" square by 3/16" thick. 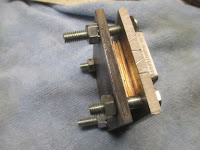 This piece should make four knife bolsters. Bravo Dan. Well done! 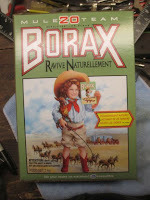 You may find better results using kerosene or methanol to "dissolve"your borax. 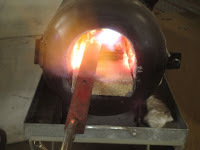 These materials have a higher capillary action than water and will burn out effectively consuming oxygen as they burn. Just another method. Your process works and the end result is beautiful. 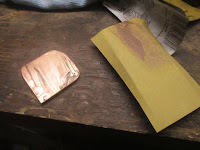 Your mokume scraps make great beads and bracelet end caps... Don't waste any of your hard work! Thank you for your kind words. I will certainly try the kerosene the next time. Hi Dan, great site. Thanks so much for all thin info. Just a thought...the 1/4 inch steel torque plates tend to flex a little in heat, and lose their compression. 1/2"-1" torque plates can regrind to flat over and over, and wont ever flex. Better compression, better merger.